My right ear has decided that its ok to go to 0g. I'm still getting 1g for my left but one down. I finally feel like I'm getting somewhere. I've officially been stretching one year in May. I'm trying to figure out if I want to stop at 7/16th or 1/2in. Guess I'll know when I get there. And on a side note I decided to go with a mohawk instead of a fauxhawk. I think I like it but I get stared at allot which isn't what I wanted. My right ear is self stretching now and even though I'm wearing 9mm jewelry 10mm fits loosely. My left ear however is at a tight 0g. I was going to stop at 10mm for a while but I've decided to just go with the flow, wear plain jewelry and stop at my goal size when it comes. Looking at your lobes id go to 1/2.. I'm at 00g 9mm now. My right ear can fit DF 10mm but my right just got to 9mm. I've bought some 10mm jewelry to sit at for a while once my left ear gets there. Some nice DF stone and bone and SF glass. I've found out I can no longer wear steel. It makes my ears really angry. I'm fairly 100% I'm going to stop at 1/2in. deviantxy wrote: I'm at 00g 9mm now. 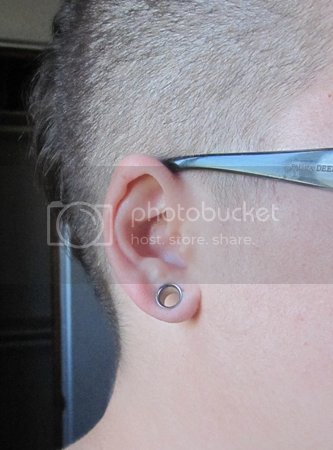 My right ear can fit DF 10mm but my right just got to 9mm. I've bought some 10mm jewelry to sit at for a while once my left ear gets there. Some nice DF stone and bone and SF glass. I've found out I can no longer wear steel. It makes my ears really angry. I'm fairly 100% I'm going to stop at 1/2in. Ya thats what i said too 1/2 was my goal size! But im now at 1/2 and already wanting to go to 9/16... I will say 1/2 is deff the start of the bigger sizes. Now a days id say 1/2 is the new 0g. I really am happy with the size but im thinking 9/16 will just be that tad bit bigger and the look ive been wanting and would be a better option for most of the Jewelery that i want. Its still not set in stone yet as i might just stay at 1/2. We shall see..
i was pretty happy with 9/16 when i was there but there were a few styles i liked that werent available in that size so i decided to go to 5/8. im really happy i did and i dont plan on going any larger.